Pumpkin might be the most successful crop to ever grow in my garden. At times I carried out some self pollination, only because there did not seem to be enough bees around, and these clumsy hands broke off too many of the male flowers in the attempt than I care to admit! As it turns out, there were plenty of bees, I just wasn’t paying attention. Either way, I’ve got a dozen lavender and rosemary cuttings that will be in place for next Spring (and many Hyssop seedlings on the way), and every bee within 5 kilometers will be stopping by to say hi. Let’s track the progress of this little pumpkin, labelled as Pumpkin Diggers Prize Winner (from Diggers). When it was time to prepare the pumpkin for storage, I left him out for a week in a sunny spot to ripen some more. During this time, the skin really firmed up, and the color lost its green for greyish pink. Smile for the camera! And notice the always lovely Ground to Ground logo. And this is a different pumpkin fruit from the same vine. It managed to grow over the neighbours fence, then over their neighbours fence, and dangling over the fence was this lovely fruit. The thing is, because it is in their property, it belongs to them!! OK fair enough, I have plenty for myself already. And yet another fruit still on the vine. Will keep this one on through Autumn to see what happens. Sow pumpkin away from your other crops, because it will outgrow everything else, and kill it all in the process. Keep the root zone well watered and fertilized, as the pumpkin is drawing a great deal of energy from the soil. There are a few organic ways to treat Powdery Mildew, and it is important that you deal with it. 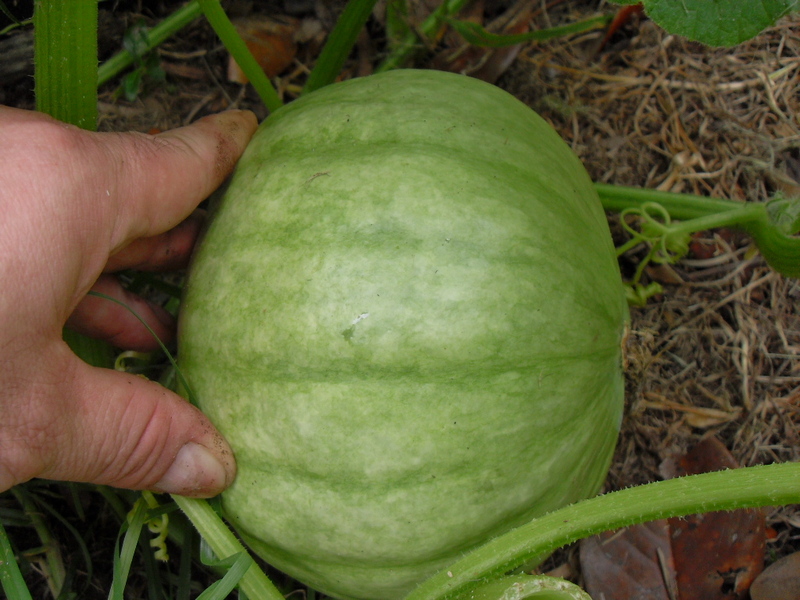 There will be so much material produced by growing pumpkin you can double its use as a green manure crop. Pumpkin likes coffee grinds as a nitrogen fertilizer, so be sure to keep adding it directly to the root zone in power or liquid, or via finished compost. What experiences have you had with growing pumpkin? Tags: coffee compost, coffee grinds, Fertilizer, Hyssop, pumpkin. Bookmark the permalink. Being completely new to growing pumpkins and used coffee, all I can say is thank you! No worries Barry. Anytime you need to know more about pumpkin coffee just let me know. How about saving those pumpkin seeds for next season, are you doing that? Sure did Daniel. I had about 100 of them and gave out at least 60 to friends. Only need 2 or 3 for myself and am really looking forward to growing them again.